The 12" Fibrox Pro Slicer with Granton Blade, also known as a carving knife, is essential when it comes to slicing meats -- think Thanksgiving Turkey. In addition, you’ll find that this slicer can expertly cut everything from roasts, hams and fish to cakes and sandwiches. 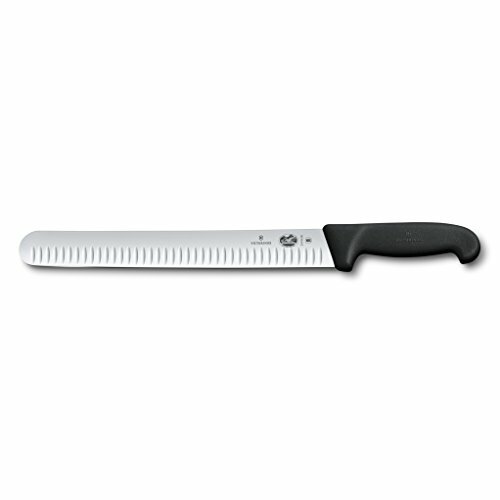 The long, 12 inch blade allows for a smooth slicing motion, even with larger cuts of meat. Smaller and thinner slices are easily achieved with the razor-sharp, high-carbon stainless steel blade with increased flexibility. The round tip and Granton blade improve meat separation, so each slice is more efficient. “Highly Recommended" by a leading gourmet consumer magazine that features unbiased ratings and reviews of cookware and kitchen equipment, this Slicer is preferred due to its comfortable handle, superior weight and balance, and its ability to precisely slice through meats in one single stroke . Tested against dozens of other slicing knives, some with price tags nearly 3 times the cost of this knife, the 12" Fibrox Pro Slicer is best in class. A part of our patented Fibrox Pro collection, this 12" slicer is preferred by professionals worldwide. Optimally weighted with high-quality, lightweight European steel that reduces hand and wrist fatigue, the 12" Fibrox Pro Slicer is comfortable even after extended use. The tapered knife edge is ground in two directions to hold a sharp edge longer, and can easily be brought back to its original sharpness. Also referred to as a hollow or fluted edge, the Granton blade features hollowed-out grooves or dimples on both sides on the blade. Depending on what is being cut, these grooves will fill with juices or create pockets of air, which decrease friction and prevent food from sticking to the blade. The straight edge is versatile and can be used for both firm and soft foods. When carving meat, the straight edge will not tear fibers or cause shredding so you can obtain uniform slices with ease. The ergonomic, non-slip patented Fibrox Pro handle provides a comfortable grip that feels secure even when greasy or wet. Designed to minimize wrist tension while providing a secure grip, the Fibrox Pro handle is both lightweight and durable, making these knives seem less likes tools and more like an extension of your hand. The National Sanitary Foundation (NSF) certifies that this product is made to the highest sanitary standards, so you can cut with confidence. Please NOTE that this item ships with the International item number 5.4723.30 on the blade and not 47645, 47645.US2, or 40645, but is the same 12" Fibrox Pro Slicer with Granton Blade. In 2011 Victorinox began marketing all its product lines, including kitchen knives, under the common umbrella name by which the company is now popularly known – Victorinox Swiss Army. Today, Victorinox Swiss Army still sells a handful of accessories, including the High Heat Turner line, under the Forschner name. In 1884, Master Cutler Karl Elsener opened a cutlery shop in Ibach, Switzerland. There, he and the cutlers’ union he formed produced the finest steel cutlery, finished with the now-famous proprietary edge preferred globally by professional and home cooks. In 1891, Karl supplied the Swiss Army with its standard issue Soldier’s Knife and in 1897 with the Officer’s Knife. In 1921, after the death of his mother, Victoria, and with the advent of stainless steel, then known as “inoxydable" and used in the production of his cutlery, Karl changed the name of the company to Victorinox. It is from those humble beginnings that a worldwide icon was born.